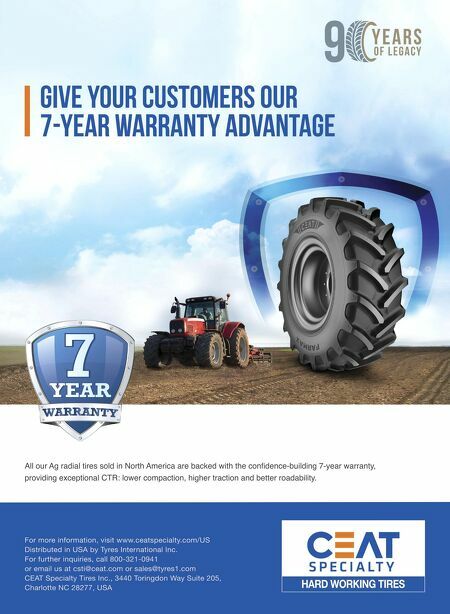 M T D J a n u a r y 2 0 1 9 34 2 0 1 9 F a c t s S e c t i o n : T i r e S h i p m e n t s U.S. TIRE UNITS SHIPPED (IN MILLIONS, INCLUDING IMPORTS) PASSENGER TIRES Year Replacement OE 2018 214.3 47.0 2017 209.3 46.0 2016 207.7 49.0 2015 205.9 49.0 2014 206.6 46.3 2013 201.6 44.0 2012 192.0 40.5 2011 196.5 36.0 2010 198.7 34.6 2009 184.0 25.0 LIGHT TRUCK TIRES Year Replacement OE 2018 31.1 5.2 2017 30.8 5.4 2016 31.4 4.9 2015 29.0 4.6 2014 28.8 4.8 2013 28.3 4.4 2012 28.3 4.2 2011 28.6 4.1 2010 28.0 3.5 2009 26.0 2.6 MEDIUM/HEAVY TRUCK TIRES Year Replacement OE 2018 21.0 6.1 2017 19.5 5.6 2016 18.4 5.3 2015 18.0 6.3 2014 17.3 5.8 2013 15.7 5.0 2012 16.0 5.3 2011 17.0 4.9 2010 15.3 3.0 2009 12.7 2.1 U.S. PASSENGER TIRE IMPORTS, 2018 (IN MILLIONS OF UNITS) Country 2018 2017 %change ailand 34.0 30.0 +13.3% South Korea 16.1 15.9 +1.2% Indonesia 12.6 15.0 -16.0% Canada 12.1 9.5 +27.3% Mexico 11.6 11.8 -1.7% China 9.0 10.5 -14.2% Vietnam 8.4 6.2 +35.4% Taiwan 8.0 8.4 -4.7% Japan 6.6 6.7 -1.5% Brazil 3.3 3.1 +6.4% Passenger tire imports from Thailand increased 79% from 2015 through 2018. The same imports from Vietnam increased 212.4% over the same time period. Germany was 11th on the list. 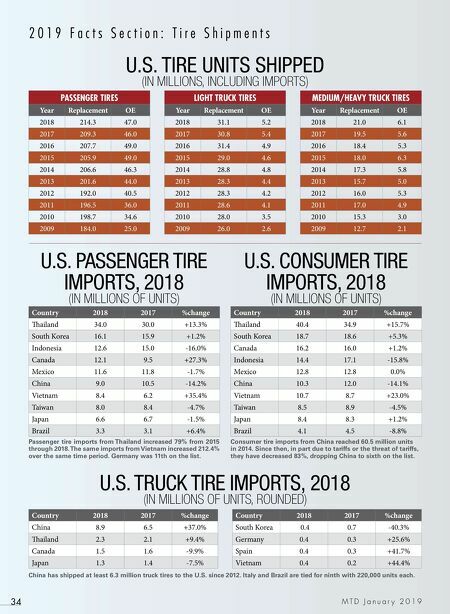 U.S. CONSUMER TIRE IMPORTS, 2018 (IN MILLIONS OF UNITS) Country 2018 2017 %change ailand 40.4 34.9 +15.7% South Korea 18.7 18.6 +5.3% Canada 16.2 16.0 +1.2% Indonesia 14.4 17.1 -15.8% Mexico 12.8 12.8 0.0% China 10.3 12.0 -14.1% Vietnam 10.7 8.7 +23.0% Taiwan 8.5 8.9 -4.5% Japan 8.4 8.3 +1.2% Brazil 4.1 4.5 -8.8% Consumer tire imports from China reached 60.5 million units in 2014. Since then, in part due to tariffs or the threat of tariffs, they have decreased 83%, dropping China to sixth on the list. U.S. TRUCK TIRE IMPORTS, 2018 (IN MILLIONS OF UNITS, ROUNDED) Country 2018 2017 %change China 8.9 6.5 +37.0% ailand 2.3 2.1 +9.4% Canada 1.5 1.6 -9.9% Japan 1.3 1.4 -7.5% Country 2018 2017 %change South Korea 0.4 0.7 -40.3% Germany 0.4 0.3 +25.6% Spain 0.4 0.3 +41.7% Vietnam 0.4 0.2 +44.4% China has shipped at least 6.3 million truck tires to the U.S. since 2012. Italy and Brazil are tied for ninth with 220,000 units each.